October’s law firm strategy topic of month was the value of client feedback. Our initial rationale for exploring this topic grew as a by-product of our June 2012 strategy question of the month. June’s survey focused on best practices in the strategic planning process. We found that one of the key factors that distinguished highly successful planning processes from their less successful counterparts was the incorporation of client feedback into the process. Specifically, we found that firms that reported having “very successful” planning processes were 45% more likely to have solicited client input than were firms that reported disappointing results. So, we thought it would be worthwhile to build a deeper understanding of what law firms are doing more broadly vis-à-vis gathering and using client feedback. What approaches are they taking to gather that feedback and what outcomes are they experiencing? Interestingly, no single approach is used consistently by more than a third of law firms participating in this month’s mini-survey. Roughly 30% of firms report they consistently have their managing partner (or his/her counterpart) conduct structured interviews with a cross section of clients. Similarly, roughly 25% of firms report they have their senior marketing or business development people conduct structured interviews with a cross section of clients. Note: in some cases, both the managing partner and chief marketing officer conduct the interviews jointly. When you include firms that report using a given approach – but who do so less consistently – the most prevalent approach to gathering client feedback is having the managing partner conduct informal (often one-off) interviews with clients. Roughly three-quarters of all firms report that their managing partner (or his/her counterpart) conducts periodic, informal interviews with clients. However, those interviews are not conducted across a cross-section of the clientele – and, they are not structured to ensure key topics are covered consistently. Written surveys of all kinds (e.g., randomized, major client focused, and/or end of matter surveys) have fallen by the wayside. That approach was fairly common in the 1990’s, but fewer than 20% firms report using written surveys (web or paper) at all. The following table presents the full range of responses relative to approaches firms are using to gather client feedback on a regular and/or irregular basis. As is always the case with these monthly mini-surveys, participants were generous in sharing some of their practical experience in the open-ended section of the survey. Among the practices and insights law firm leaders shared were the following. We require annual meetings with top 100 clients on an annual basis. The meeting is structured and performed by supervising attorney. 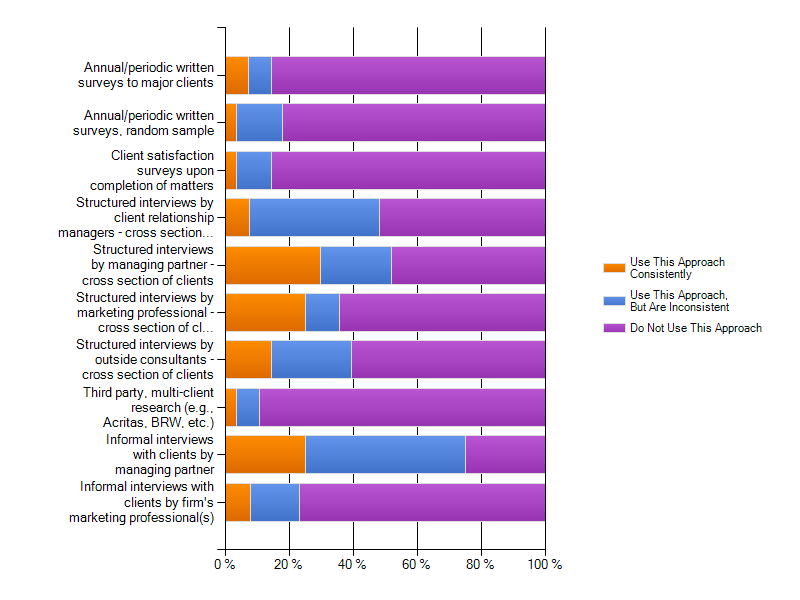 Top 25 clients are also contacted by firm managing partner on at least an annual basis. We spend a lot of time educating/helping our senior attorneys develop disciplined, regular communications with their clients…we emphasize that all our attorneys need to know their client business/industry well. (Our) client teams develop a (tailored) method that fits the client’s culture and relationship to evaluate how the firm is performing. (Examples include) team meetings with the various client contacts; in-person meetings between the key contact at the client and the (lead) attorney; and various contact attorneys reaching out to their respective contacts in the client organization…assessing our performance as the defined purpose. Obviously, it is always helpful to have a sense for what our peers are doing to manage their respective firms more effectively. More importantly, however, it is critical to understand what results can and should be expected from pursuing any given management practice. In the case of gathering client feedback, the key benefits can be summarized in four points (reflecting five sets of insights firms report gaining more than half the time – either always or often). First, over 70% of law firm leaders report gaining genuine insights into how to manage their client relationships more effectively. Second, over 60% of law firms gain new insights into how their clients view the firm’s strengths and its opportunities to improve (i.e., its weaknesses and shortcomings). Nearly 60% reported that the client feedback process always or often produces opportunities to do more of the type of work the firm is already doing for that client (i.e., to deepen the relationship). Over half reported that gathering client feedback always or often produces opportunities to do new types of work for clients (i.e., to broaden the relationship. 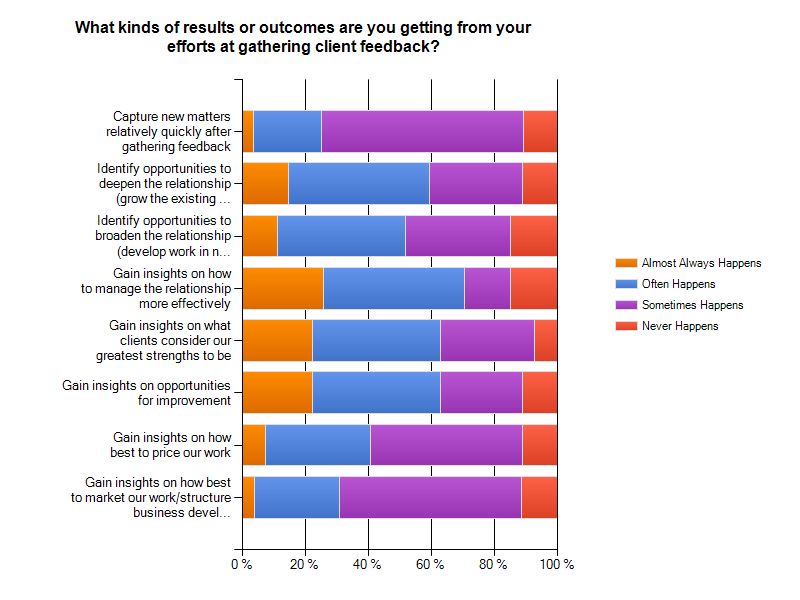 A complete summary of the outcomes firms experience via client feedback gathering processes is captured on the following chart. Given the fact that structured, formalized client feedback processes are only pursued with high levels of consistency at somewhere between a third and half the firms surveyed, it strikes us that this type of outreach can still be a source of competitive advantage for law firms. It is certainly a factor distinguishing more successful strategic planning processes from the rest. And, our anecdotal experience confirms what we learned more systematically from this survey. Namely, asking clients for their feedback generates goodwill; it often creates new work (sometimes, entirely new work in new areas); and it provides valuable insights into what the firm does well, how it can improve, and how it can manage client relationships more effectively. At Sterling Strategies, we tend to gather structured client feedback in the context of strategic planning assignments (though we do so as stand-alone engagements on occasion). However, our friends at the Wicker Park Group focus intensively on the client feedback process. They even publish a continuing series of client Q&A summaries you might find interesting. As always, the comments section is open – and we always welcome your calls and emails. Interesting that End of Matter or End of Action surveys have fallen by the wayside…I think these still do have vaule, if done in the right way and if they are short and to the point. Thoughts? I would agree there is value. It may be a function of approach. Note that a pretty high percentage of firms are doing some form of informal feedback gathering – either by the relationship partner or the managing partner. That may be where end of matter feedback is being gathered – at least following major cases/deals.